THERION was founded in 1987 by Christofer Johnsson their debut album Of Darkness… “was released in 1991 and was a huge success for the band within the underground Metal scene. THERION began as a very creative Death Metal band, pushing limits of the contemporary sound and grew beyond themselves. In the course of the years, the bands style developed in a quite unique way and between 1991 and 1996 THERION released groundbreaking records, one being more special than the other. 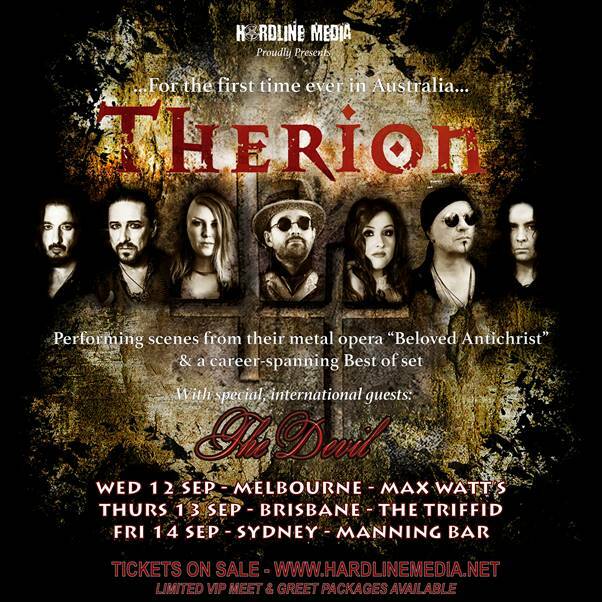 In 1996 THERION released Theli which would be the ultimate breakthrough for the band. At this time THERION turned towards a more opera-like, progressive and even orchestral sound. Vovin and Deggial are dominated by the new style of catchy symphonic opera metal Christofer invented. Then came Secrets of the Rune, their first concept album, dealing with Nordic myths and influenced by Scandinavian Folk music. The double record Lemuria / Sirius B was a huge success then THERIONengaged themselves with the recording of Gotihc Kabbalah and The Miskolc Experience. After that Christofer decided it was time for a change: Sitra Ahra was done with a completely new lineup. THERION have evolved from a mere death metal act into one of the first projects to take a trip towards the world of classical music, setting the initial standards to a style later known as symphonic metal. When 15 year old prodigy Christofer Johnssonfounded THERION as a death metal band in 1987, little did he know that exactly 30 years later he would put the final touches to a project that will go down in history as symphonic metal’s most ambitious release. While ‘rock operas’ are no longer an unusual concept, this term will now receive a new meaning when the curtain opens for Johnsson’s lifelong creation: Beloved Antichrist is the title of his spectacular brainchild, consisting of 3 full-length CDs. It is more than just a concept album; it’s a complete rock opera unveiling a sweeping story inspired by Vladímir Soloviov “A Short Tale Of The Antichrist“.